Whenever we consider the possibilities of global progress, it is always good to take a second look at our initial observations. It can be especially helpful to gain broader perspective not only on each event as it transpires, but on the possible connections and common denominators between world events. I have enjoyed watching the Destroying the Illusion channel for some time now for these particular reasons. I have always found the material on DTI to be eye-opening and thought-provoking. Jordan Sather has a way of connecting subjects in a plausible way with an overall positive outlook. This video was definitely up to par with the rest. At the same time, it offered something unexpected and seemingly extrinsic. The interesting and yet strange developments discuss seem to reveal little and yet a substantial amount of detail when we read between the lines of current headlines. There is much more to say on these subjects, but before getting to that, here is Jordan Sather and Destroying the Illusion. This apparent post from Mega-Anon seems very out-of-character when compared to other posts we've seen from this 4Chan source. This post boasts hubris, swearing in excess as we haven't seen before, strange personal attacks against one YouTuber (who happened to work with Corey Goode in the past), and signs of neuro-linguistic programming. The other 4Chan posts have been largely constructive, professional, and seemed to address the entire country, but this one reads more like the spouting of an internet troll. I've seen this type of excessively rude and manipulative language used before and soon after, I watched those who used it get kicked out of online social communities for being abusive. Up until this point we have not seen anything close to this level of verbal abuse or of fixation upon one mistake by one person from authentic 4Chan sources. This 4Chan post seemed over the top and in my experience, this is a key sign that we are dealing with a professional internet troll and NLP manipulator—not the real Mega-Anon. It seems fairly obvious that this is not the original Mega-Anon that has been informing the people via 4Chan. It appears that following the briefing which David Wilcock received from the woman posting as the authentic Mega-Anon, other parties on the 4Chan website assumed the name and deliberately attempted to trigger Sather with this odd thread of verbal abuse. The censorship which David Wilcock has undergone has been profound compared to past instances of information suppression. Wilcock had his Wikipedia page deleted and afterward, Wikipedia quite literally pretended that the page never existed. His recent book The Ascension Mysteries made the stats for the New York Times Best Seller list, but the NY Times refused to put Wilcock's book on the list and fraudulently placed Hillary Clinton's book on the list instead (when in actuality, Clinton's book was a flop). Following these censorship measures, interests behind the scenes then attacked Wilcock's YouTube channel—trumping up a false claim that he had copyrighted material on his channel and disabled it completely. After roughly a week of disputing that fraudulent claim, Wilcock's channel was restored. 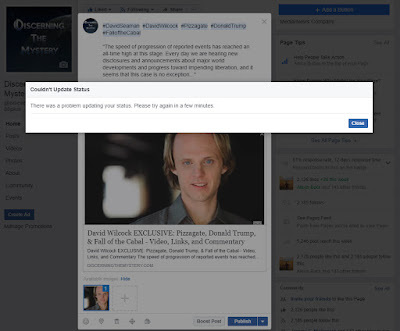 Now the latest game seems to be to use Facebook's algorithms to mark anything with David Wilcock's name on it as spam or to block it from posting completely. Facebook users have become used to seeing messages like this (above) consistently after trying to post anything from David Wilcock or the Gaia network. Yes, I realize that this happens with other posts, but authentic problems of this nature eventually clear up for the issue causing the delay. These never clear up even after months of time. Considering all of these efforts at suppression, it does not at all surprise me that hidden interests would again, attempt to muddy the waters of disclosure by creating spoof Mega-Anon accounts and trolling truth-seekers such as Jordan Sather. As they say, "When you get trolled this hard, you are probably doing something right." Judging from the recent smear attempts from 2016 against everyone who has worked with Corey Goode, it would not surprise me if one or two of these interests were back in the game of causing trouble and attempting to slow disclosure in a more pronounced way. This strange animosity we see coming from this Mega-Anon post comes in less than twenty-four hours from another hit piece written about another person who has worked with Corey Goode. This was author and speaker, Bentinho Massaro. Bentinho is a public speaker and motivator by trade and hosts a study group in Sedona, AZ. His group studies self empowerment, conscious creation and manifestation, and discusses how these practices can help the collective of humanity reach new heights of potential and development. These subjects are a common area of study discussed by multiple Hindu and Buddhist teachers from ancient to modern times, and are common subjects of interest within the truth community. Though DTM does not blindly subscribe to any particularly belief system, the tactics used to smear Massaro's character were particularly notable compared to past smear campaigns launched against members of the truth community. Per the old smear-campaign tactics we have come to know, many of these ancient disciplines and beliefs appeared to be painted as evil. This narrative was then used to further smear Secret Space Program whistleblower, Corey Goode, simply because these two men worked together at some point in the past. I find it very interesting that we see the same tactics of neuro-linguistic programming both within this 4Chan post and within the smear piece written to attack Bentinho and the Sedona study group. Combined with the extreme uptick in similar trolling I have personally seen as a Facebook group admin, I believe this is nothing more than the typical coordinated attack. The subject of soft disclosure is a big topic especially at this point. The extreme desire for full disclosure of secrecy on the planet has been a major subject of discussion in awakened communities. At the moment, we seem to be constantly receiving nugget after nugget of formerly secret information. This slow process of revelation has a way of peaking the interests of those who know the various subjects of disclosure while at the same time, aggravating some who have grown impatient with the slow pace. For those who are still largely unaware of the subject of disclosure, these issues simply pass right by without being noticed. The knowledge gap between those who are aware and those who are largely oblivious seems to be growing wider as the days go by, and this is understandable. The subtle means by which this information is communicated seems to be educational to those who are aware while allowing those who are unaware to remain blissfully ignorant. This may continue for a short time, but eventually, the truth will be impossible to ignore. In my opinion/suspicion Lynn de Rothschild has already been eliminated, but consider this. If one of the central banking heads died in a plane crash above their home in Buckinghamshire, England, do you really think the corporate media would report it? Moreover, do you think the Alliance would allow such drastic developments to come forward so abruptly? The world economy might be reduced to chaos unless the new financial system were allowed to come online prior to such an announcement. I have no evidence to support this hypothesis. If it's not true, that's fine. The Cabal is out either way, but I have a strange feeling that this tweet/exchange between Lynn de Rothschild and those who have apparently made attempts at eliminating her was merely performance for the sake of appearances. As we may know, these developments do not merely involve a game of information. In the world of the covert, the game is misinformation and deception. In order to successfully take down a world-wide crime syndicate, news and public information must be spun in various ways so as to avoid telegraphing the next moves of the Alliance. This is not to say that Jordan is deceiving anyone, but to say that even those of us who comprise the alternative media are left guessing as to what the truth might be. This mystery can be advantageous to both sides of the fight for truth, depending upon the circumstances. Eventually, we will have the full story and when the revelation breaks, there will be no denying it. Until then, all we can do is keep our eyes and minds open, and remain flexible. This way, when the truth comes forward, we will recognize it.